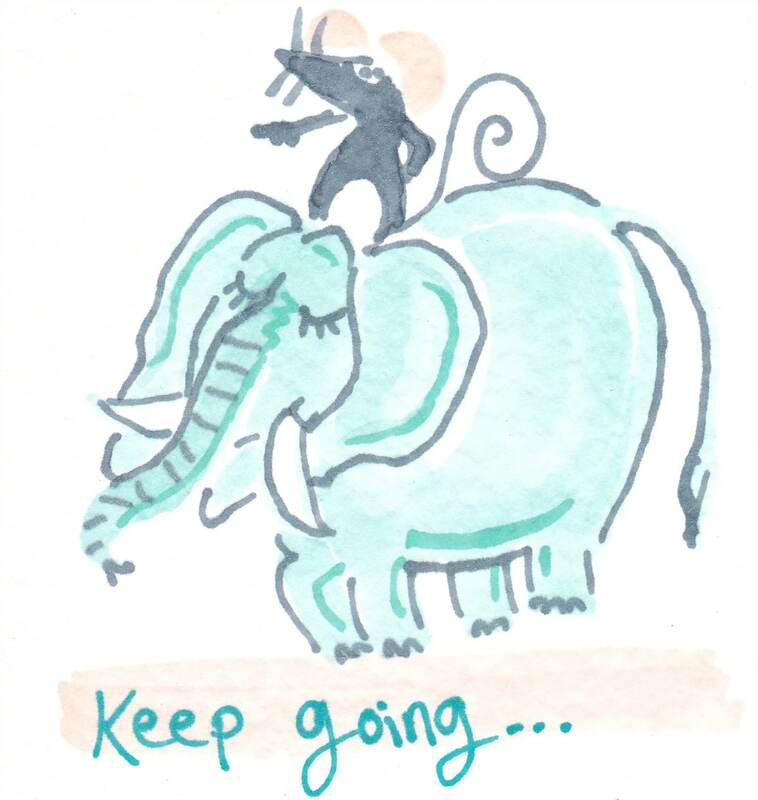 It’s The Himalayas – Keep Going! You know, when you’re having one of those down-days and all the excitement and passion of building a business are buried under an avalanche of things you ‘should’ be doing – and you know you’re not playing full out.. When you’re doubting you’ve got what it takes and you feel like giving up and getting a job. Getting a job would be so much easier, wouldn’t it? Easier – maybe. Safer? Perhaps, though there’s no guarantee of job security these days. To grow a successful business, we need to keep growing ourselves. I’ve heard it described as personal development on steroids or like a hike through the Himalayas. And to keep going requires self-acceptance, forgiveness, persistence, courage and a strong connection to your Big Why, the difference you want to make in the world. It’s a journey of constantly challenging yourself to meet and overcome the mountains and valleys of fear and self-doubt as you dare to put yourself out there and reach more people with your gifts. You meet a long list of limiting beliefs, ‘yes buts’ and reasons why not that rise up to greet you every single time you try to expand your comfort zone. Like when you quote your full price. Or raise your rates. Or even just expect to get paid for the work that you do! And like a hike through the mountains, if you keep going for your dreams in spite of everything, if you challenge yourself to keep going no matter what, you’ll notice that what looks like Mount Everest seen from the bottom, is more like a pimple when seen from the top. Then you’ll ask yourself what all the fuss was about? Until the next mountain comes into view☺. Rather than obstacles, I like to see the challenges and blocks as opportunities to grow, because yet another little piece of me is coming forward for integration and healing. And because energy comes first in anything we want to create, this inner personal development work is key to any changes we want to make in the outer world, so it’s fundamental to our success. What’s your current Mount Everest? Which big hairy task that scares the pants off you is the biggest challenge (and opportunity for growth) that you face at the moment in your business? And what are you doing to meet the challenge? We’d love to know. Please share in the Comments below. Ready for change and need a guide? I am here for you. I’ll hold a safe space and give you some tools that will serve you for life. I have maps of the mountains and will show you some shortcuts. If this speaks to you, go here now and apply for a completely free, no obligation Discovery Session, so you can grow your self, grow your business and achieve all the success you (and those looking for you) desire and deserve. PS: Did you like this post? If you know anyone else who could use some encouragement to ‘keep going’, please share this post with them – we need them to show up with their gifts. 10 Comments on It’s The Himalayas – Keep Going! This is a great post for anyone running a business that they really care about. You’re so right about having Mount Everest to climb! My current Mount Everest is licensing people in the UK to run War to Peace so that we can give many more people access to our methodology. It’s massively exciting and of course, comes with many challenges! And for me, whenever dreams are coming closer to reality, I have than initial moment of doubt and fear before the excitement kick in again and propels me forward to reach the summit. Once I get there, I realise that in my mind I am already halfway up my next mountain and wondering why on earth I found the first one challenging – and so it goes on! It is a spiritual journey, a mental one, an emotional one – and an exciting one! It’s great to have guides along the way to support you and I highly recommend investing in one if you don’t have one already. Chloe O’Sullivan recently posted…ARE YOU SEEKING MENTAL CLARITY? STOP LISTENING, START OBSERVING. Love your current Mount Everest – that’s so exciting! Great post, Linda. My current big hairy scary task is around actively selling when I speak to groups. Traditionally, I’ve always used live events to build my email list and then I do the selling from my blog. This works very well – AND why not do both? So, last weekend, having taken Cath Watkin’s training, I spoke at a big event and did a full, proper sales presentation. One person signed up then and there (and for a £500 course, that’s quite mind-blowing for me) AND nobody walked out AND people bought the book AND people still signed up to join my list. So, I’m seeing it’s a YES, AND. Blogging + speaking = pure gold. Corrina Gordon-Barnes recently posted…Too Shy To Sell? Fantastic, Corrina – congratulations on diving in and getting results! Hi Linda – yes an excellent post. I am just teetering on the top of a current mountain having got brave enough to make my MailChimp guide available as a download from my website. Selling something I have created from my website has been a big hairy scary goal for so long (what if people don’t like it, what if the download doesn’t work, what if, what if..). But thankfully it seems its all working and they do like it – yeah! So I can begin to think about the next mountain to climb. And thinking about being on top is such an encouragement when you are just starting the climb. Rosemarie recently posted…Reveal the magic behind your featured images! Congratulations on getting your guide out there Rosemarie and not letting the gremlin voices stop you! Feel free to post a link back here to your Mailchimp guide, for anyone who’s interested. The synergy between spiritual development and self-employment resonates deeply with me, Linda. One seems to spark ideas for the other along the way! I can see my mountain and the journey is rewarding … it just gets a wee bit foggy at times. My next Mount Everest? Video blogs. Know just what you mean about ‘a wee bit foggy at times’, Lisa, and I’m guessing most people reading this would say the same.